The state Senate passed an amended version of the operating budget totaling $52.5 billion for the next biennium with 31 in favor and 17 opposed. With more than 40 amendments discussed on the floor, debate over the operating budget took longer than four hours late Thursday. In the end, three Republicans joined the majority in voting to pass the amended version. Sen. Christine Rolfes, D-Bainbridge Island, wrote the 2019-21 budget as the chair of the Ways and Means Committee. “I am proud to rise today to urge my colleagues to pass a smart budget that puts people first and fulfills commitments that this body has made to quality education and a more effective behavioral health system,” said Rolfes. Sen. John Braun, R-Centralia, is the ranking Republican on Ways and Means and therefore is the budget lead for his party. Braun encouraged the consideration of a broad range of ideas, which he said was evident in the large number of amendments proposed by Republicans on the floor. Braun noted that the budget doesn’t rely on an income tax, a property tax, or a change in the business and operation tax, as an positive. “Even though this budget does, ultimately, use additional revenue and I don’t think that was necessary to make it work, overall it balances over four years, something we have found very important,” said Braun. Braun voted in favor of the budget, along with Sen. Randi Becker, R- Auburn, and Maureen Walsh, R-Walla Walla. However, Minority Leader Mark Schoesler, R-Ritzville, voted against the budget, citing tax increases among other issues. “There are priorities on this side of the aisle that don’t mesh with some of the priorities on the other side but when you have $5.6 billion of new revenue … it’s not that tough,” said Schoesler. Sen. Walsh said, “the reality is it’s a campaign expenditure.” Other lawmakers suggested that Inslee reimburse the state for his security costs while he is traveling for the campaign or till he resigns, while running for office. 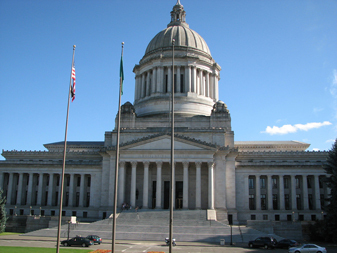 Sen. Rolfes said the underlying budget contains funding for the approximately $1.4 million increase to the Washington State Patrol unit because the governor must be protected and the money has to come from somewhere. The amendment failed with 25 opposed and 22 in favor. The House of Representatives passed its version of the budget last week in a party-line vote. The two chambers now move to budget negotiations to craft a final version for the governor to sign into law. The legislative session is scheduled to end on April 28.